Observation - Maze Gill? - UK and Ireland. Description: Found growing on very decayed wood, felled 8-10 years ago. Unable to tell tree species but in this part of the wood it is most likely oak, if not then ash. 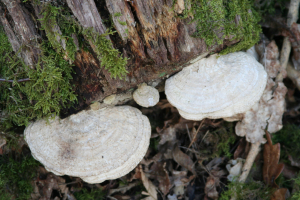 Found growing on very decayed wood, felled 8-10 years ago. Unable to tell tree species but in this part of the wood it is most likely oak, if not then ash.